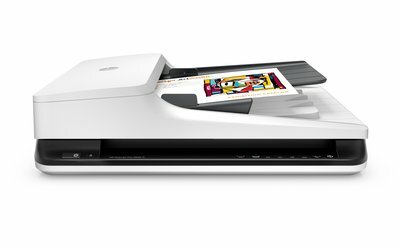 Enhance productivity for routine scanning with a compact HP ScanJet Pro. Automate workflow with fast, two-sided scanning, a 50-page ADF, 1,500-page daily duty cycle, and one-button shortcuts. You can even quickly capture and edit text from documents. Media Size A4 8.27" x 11.69"; A5 5.83" x 8.27"; A6 4.13" x 5.83"; B5 6.93" x 9.84"; Index Card; Photo 3.94" x 5.91"; 8.50" x 10.17 ft; 3.50" x 5.83"; 8.50" x 11.69"; Legal 8.50" x 14.02"; Letter 8.50" x 10.98"
Streamline routine work with one-touch scanning—create one-button, custom settings for recurring scan jobs. Reliable, high-speed scanning at up to 25 pages/50 images per minute. Designed to handle up to 1500 sheets per day. Save time and reduce waste with two-sided scanning that captures both sides of the page in a single pass. Create one-button scan settings for recurring tasks. Define scan profiles and scan to multiple destinations with included HP Scan software. Scan documents up to 8.5 x 122 inch (21.6 x 309.9 cm) through the ADF, and use the flatbed for bulky media. Built in OCR software lets you create searchable files right from the scanner, so you can find the document you need, when you need it. Edit and organize documents with a suite of included feature-rich software. Scan directly into applications without opening another program with the full-featured TWAIN driver. Load up to 50 pages into the automatic document feeder for fast, unattended scanning. Instant-on Technology lets you begin scanning quickly. hereinTexas: good document scanner however it is no where neat the 10 year old machine that I can not get software for my new computer. lghart1: The Scanjet G3010 which this scanner replaced had a simple one button to push and have the scan sent directly to my printer. A simple copy machine! The 2500 f1 requires me to save the scan and then go to the saved scan file and print the item. Product performs extremely well and is fast. FJSAM: Product performs as expected, which is extremely well, and is very fast. A future enhancement for this device would be a network port (ethernet). That way multiple home computers would be able to access it. For text & images: PDF, JPEG, PNG, BMP, TIFF, TXT(Text), RTF (Rich Text) and searchable PDF. HP Scanner Device Driver, HP WIA Scan Driver, HP TWAIN Scan Driver (Certified), HP Scan, HP Scanner Tools Utility, HP Event (Button) Handler, HP Windows Installer, I.R.I.S. Readiris Pro, I.R.I.S. Cardiris, Nuance PaperPort, SDK (software Development Kit), LPDF (file with link to download software), No Mac Software on CD. 1 Scan speeds of up to 40 ipm measured at 300 dpi (black and white, grayscale, and color). Actual processing speeds may vary depending on scan resolution, network conditions, computer performance, and application software.